Drucker and Nowviskie see the potential for radical shifts in the union of computing and of humanistic research. They wish to transcend the “concrete” structures of authorities and hierarchical models that dominate present digital humanities practices (think of the Getty Vocabularies) and instead define more flexible spaces for visualization that can lead to new insights and paradigms for interpreting cultural materials. I am interested in one of the challenges facing digital humanists that they set out at the start of their essay: “overcom[ing] humanists’ long-standing resistance (ranging from passively ignorant to actively hostile) to visual forms of knowledge production.” Drucker and Nowviskie characterize current humanities research as deeply ended in textual modes of thinking and argumentation (in their words, a “logocentric” mode). 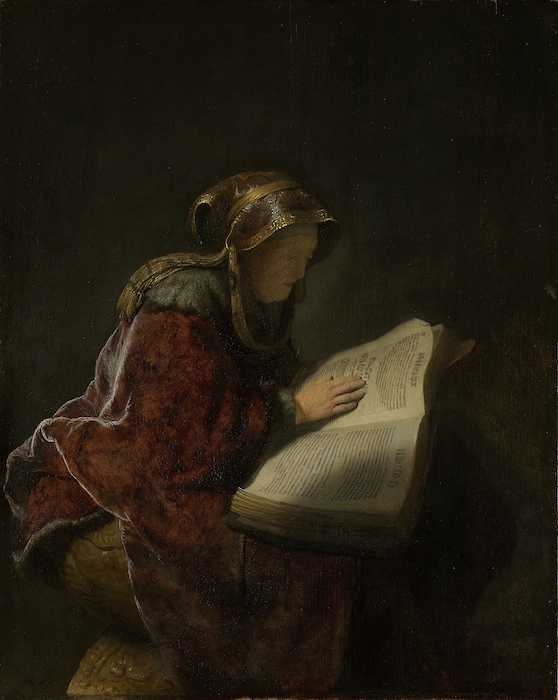 Rembrandt van Rijn, Old Woman Reading, 1631. Rijksmuseum, Amsterdam. I’ve come to find that, though art historians may skillfully read and interpret the visual poetics in their objects of study, we rely almost exclusively on narrative argumentation to stitch these discrete visual interpretations into a cogent, productive argument. Rare indeed is the art historical argument generated from “visual thinking”, i.e., where concepts such as social networks, intellectual history, etc. are approached from the start as concepts that can and should be visualized. Our subjects may be visual, in other words, but our mode of argumentation are deeply-rooted in the linear, sequential logic of a text string. This is a powerful method of thinking and expressing, to be sure! However I think it may account for the surprise that occurs in an art historical talk when a diagram, network map, or even text ordered outside the conventional linear sequence, pops up in a PowerPoint presentation. I remember several years back attending a talk by a leading Rembrandt scholar, Ernst van de Wetering, editor of the Rembrandt Research Project. His presentation, discussing the impact of Rembrandt’s painting on Dutch art theory, was accompanied by scans of paper napkins on which he had scratched out several diagrams showing the positions of theorists before Rembrandt, which were then channeled through his works and popped out on the other side as writings by theorists after Rembrandt. The delivery could not have been simpler, nor the audience more certain of his argument. That art historians often continue to be surprised by the occasional appearance of concept visualizations suggests that Drucker and Nowviskie are right to suspect a deep-seated, if unknowing resistance to visual modes of knowledge production. That we at the same time seem delighted by their effects suggests we ought to push those boundaries further, provoking new thinking about our old objects. Lincoln, Matthew D. "Aesthetic Provocations." Matthew Lincoln, PhD (blog), 22 May 2013, https://matthewlincoln.net/2013/05/22/aesthetic-provocations.html.